We’re super excited to announce the release of ghosts in The Sims 4. Check out our guide below! Ghosts, how do they work? Just how do you find these spooky creatures from the spirit world? When a Sim dies, non-player character (NPC) ghosts attach to a tombstone or urn around your Sim’s home or yard. But these aren’t just decorations. 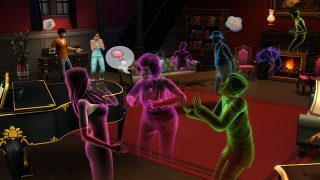 You can build relationships with these ghosts, and invite them to join your Sim’s household where they can become playable characters. Once a ghost is “playable” it can get a job, get married and contribute to the family like any living Sim. Of course, they wouldn’t be properly undead without some special ghostly abilities and behaviors. Ghosts are a moody bunch and much of what they do depends on how they’re feeling and how they died. 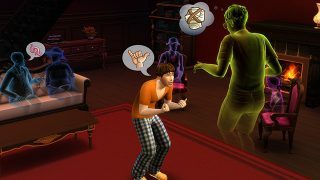 Ghosts that die from laughter stay positive, with a moodlet causing nearby Sims to become playful. Beware of ghosts that die from anger, as they will have a very different attitude. Other ghosts will have more…unique behaviors. Sims that have been electrocuted to death will become ghosts capable of breaking objects by possessing them. Victims of the Cow Plant spend the afterlife interested in gardening; if you’re lucky, a ghost will lovingly tend to your Sim’s garden, but a bad mood will lead to a yard full of dead plants. Luckily it’s pretty easy to tell what mood a ghost is in as they tend to radiate their emotions for everyone to see - it’s the undead version of wearing your emotions on your sleeve. The way you play determines ghost behavior as well. If you keep your ghost Sims happy they’ll be a big help around the house freeing Sims to spend time working on goals, making friends or whatever it is that makes them happy. For example, you may hate how long it takes normal Sims to repair objects around the home. With ghosts around you can use “ghostly repair” to save all kinds of time! A Ghost Sim can even be used as a sort of maid that tidies up while your Sim family sleeps if the Ghost Sim has the “neat” trait. Tired of your ghost Sim? No problem! Ghosts can be easily banished to the netherworld with one interaction on their urn or tombstone. You can also bring ghosts back to life! If a Sim has a high enough gardening and cooking skill they can make a tasty plate of Ambrosia to bring ghosts back from the dead. You’ll need three ingredients to do that – Angelfish, a Death Flower and the Potion of Youth. We really hope that you enjoy the new ghostly gameplay and we can’t wait to see what new stories you’re going to tell. Happy haunting Simmers! P.S. Make sure you launch Origin to download the latest update. It will automatically introduce ghosts into your game.